(a) Social workers should respect clients’ right to privacy. Social workers should not solicit private information from clients unless it is essential to providing services or conducting social work evaluation or research. Once private information is shared, standards of confidentiality apply. (b) Social workers may disclose confidential information when appropriate with valid consent from a client or a person legally authorized to consent on behalf of a client. (c) Social workers should protect the confidentiality of all information obtained in the course of professional service, except for compelling professional reasons. The general expectation that social workers will keep information confidential does not apply when disclosure is necessary to prevent serious, foreseeable, and imminent harm to a client or other identifiable person. In all instances, social workers should disclose the least amount of confidential information necessary to achieve the desired purpose; only information that is directly relevant to the purpose for which the disclosure is made should be revealed. (d) Social workers should inform clients, to the extent possible, about the disclosure of confidential information and the potential consequences, when feasible before the disclosure is made. This applies whether social workers disclose confidential information on the basis of a legal requirement or client consent. (e) Social workers should discuss with clients and other interested parties the nature of confidentiality and limitations of clients’ right to confidentiality. Social workers should review with clients circumstances where confidential information may be requested and where disclosure of confidential information may be legally required. This discussion should occur as soon as possible in the social worker-client relationship and as needed throughout the course of the relationship. (f) When social workers provide counseling services to families, couples, or groups, social workers should seek agreement among the parties involved concerning each individual’s right to confidentiality and obligation to preserve the confidentiality of information shared by others. Social workers should inform participants in family, couples, or group counseling that social workers cannot guarantee that all participants will honor such agreements. (g) Social workers should inform clients involved in family, couples, marital, or group counseling of the social worker’s, employer’s, and agency’s policy concerning the social worker’s disclosure of confidential information among the parties involved in the counseling. (h) Social workers should not disclose confidential information to third-party payers unless clients have authorized such disclosure. (i) Social workers should not discuss confidential information in any setting unless privacy can be ensured. Social workers should not discuss confidential information in public or semipublic areas such as hallways, waiting rooms, elevators, and restaurants. (j) Social workers should protect the confidentiality of clients during legal proceedings to the extent permitted by law. When a court of law or other legally authorized body orders social workers to disclose confidential or privileged information without a client’s consent and such disclosure could cause harm to the client, social workers should request that the court withdraw the order or limit the order as narrowly as possible or maintain the records under seal, unavailable for public inspection. (k) Social workers should protect the confidentiality of clients when responding to requests from members of the media. (l) Social workers should protect the confidentiality of clients’ written and electronic records and other sensitive information. Social workers should take reasonable steps to ensure that clients’ records are stored in a secure location and that clients’ records are not available to others who are not authorized to have access. (m) Social workers should take reasonable steps to protect the confidentiality of electronic communications, including information provided to clients or third parties. Social workers should use applicable safeguards (such as encryption, firewalls, and passwords) when using electronic communications such as e-mail, online posts, online chat sessions, mobile communication, and text messages . (n) Social workers should develop and disclose policies and procedures for notifying clients of any breach of confidential information in a timely manner. (o) In the event of unauthorized access to client records or information, including any unauthorized access to the social worker’s electronic communication or storage systems, social workers should inform clients of such disclosures, consistent with applicable laws and professional standards. (p) Social workers should develop and inform clients about their policies, consistent with prevailing social work ethical standards, on the use of electronic technology, including Internet-based search engines, to gather information about clients. (q) Social workers should avoid searching or gathering client information electronically unless there are compelling professional reasons, and when appropriate, with the client’s informed consent. (r) Social workers should avoid posting any identifying or confidential information about clients on professional websites or other forms of social media. (s) Social workers should transfer or dispose of clients' records in a manner that protects clients' confidentiality and is consistent with applicable laws governing records and social work licensure. (t) Social workers should take reasonable precautions to protect client confidentiality in the event of the social worker's termination of practice, incapacitation, or death. (u) Social workers should not disclose identifying information when discussing clients for teaching or training purposes unless the client has consented to disclosure of confidential information. (v) Social workers should not disclose identifying information when discussing clients with consultants unless the client has consented to disclosure of confidential information or there is a compelling need for such disclosure. (w) Social workers should protect the confidentiality of deceased clients consistent with the preceding standards. Marriage and family therapists have unique confidentiality concerns because the client in a therapeutic relationship may be more than one person. Therapists respect and guard the confidences of each individual client. 2.1 Disclosing Limits of Confidentiality. Marriage and family therapists disclose to clients and other interested parties at the outset of services the nature of confidentiality and possible limitations of the clients’ right to confidentiality. Therapists review with clients the circumstances where confidential information may be requested and where disclosure of confidential information may be legally required. Circumstances may necessitate repeated disclosures. 2.2 Written Authorization to Release Client Information. Marriage and family therapists do not disclose client confidences except by written authorization or waiver, or where mandated or permitted by law. Verbal authorization will not be sufficient except in emergency situations, unless prohibited by law. When providing couple, family or group treatment, the therapist does not disclose information outside the treatment context without a written authorization from each individual competent to execute a waiver. In the context of couple, family or group treatment, the therapist may not reveal any individual’s confidences to others in the client unit without the prior written permission of that individual. 2.3 Client Access to Records. Marriage and family therapists provide clients with reasonable access to records concerning the clients. When providing couple, family, or group treatment, the therapist does not provide access to records without a written authorization from each individual competent to execute a waiver. Marriage and family therapists limit client’s access to their records only in exceptional circumstances when they are concerned, based on compelling evidence, that such access could cause serious harm to the client. The client’s request and the rationale for withholding some or all of the record should be documented in the client’s file. Marriage and family therapists take steps to protect the confidentiality of other individuals identified in client records. 2.4 Confidentiality in Non-Clinical Activities. Marriage and family therapists use client and/or clinical materials in teaching, writing, consulting, research, and public presentations only if a written waiver has been obtained in accordance with Standard 2.2, or when appropriate steps have been taken to protect client identity and confidentiality. Marriage and family therapists store, safeguard, and dispose of client records in ways that maintain confidentiality and in accord with applicable laws and professional standards. 2.6 Preparation for Practice Changes. In preparation for moving a practice, closing a practice, or death, marriage and family therapists arrange for the storage, transfer, or disposal of client records in conformance with applicable laws and in ways that maintain confidentiality and safeguard the welfare of clients. Marriage and family therapists, when consulting with colleagues or referral sources, do not share confidential information that could reasonably lead to the identification of a client, research participant, supervisee, or other person with whom they have a confidential relationship unless they have obtained the prior written consent of the client, research participant, supervisee, or other person with whom they have a confidential relationship. Information may be shared only to the extent necessary to achieve the purposes of the consultation. If psychologists’ ethical responsibilities conflict with law, regulations or other governing legal authority, psychologists clarify the nature of the conflict, make known their commitment to the Ethics Code and take reasonable steps to resolve the conflict consistent with the General Principles and Ethical Standards of the Ethics Code. Under no circumstances may this standard be used to justify or defend violating human rights. If the demands of an organization with which psychologists are affiliated or for whom they are working are in conflict with this Ethics Code, psychologists clarify the nature of the conflict, make known their commitment to the Ethics Code and take reasonable steps to resolve the conflict consistent with the General Principles and Ethical Standards of the Ethics Code. Under no circumstances may this standard be used to justify or defend violating human rights. Psychologists cooperate in ethics investigations, proceedings and resulting requirements of the APA or any affiliated state psychological association to which they belong. In doing so, they address any confidentiality issues. Failure to cooperate is itself an ethics violation. However, making a request for deferment of adjudication of an ethics complaint pending the outcome of litigation does not alone constitute noncooperation. (a) Psychologists may disclose confidential information with the appropriate consent of the organizational client, the individual client/patient or another legally authorized person on behalf of the client/patient unless prohibited by law. Psychologists do not disclose in their writings, lectures or other public media, confidential, personally identifiable information concerning their clients/patients, students, research participants, organizational clients or other recipients of their services that they obtained during the course of their work, unless (1) they take reasonable steps to disguise the person or organization, (2) the person or organization has consented in writing, or (3) there is legal authorization for doing so. Counselors recognize that trust is a cornerstone of the counseling relationship. Counselors aspire to earn the trust of clients by creating an ongoing partnership, establishing and upholding appropriate boundaries, and maintaining confidentiality. Counselors communicate the parameters of confidentiality in a culturally competent manner. Counselors maintain awareness and sensitivity regarding cultural meanings of confidentiality and privacy. Counselors respect differing views toward disclosure of information. Counselors hold ongoing discussions with clients as to how, when, and with whom information is to be shared. Counselors respect the privacy of prospective and current clients. Counselors request private information from clients only when it is beneficial to the counseling process. Counselors protect the confidential information of prospective and current clients. Counselors disclose information only with appropriate consent or with sound legal or ethical justification. At initiation and throughout the counseling process, counselors inform clients of the limitations of confidentiality and seek to identify situations in which confidentiality must be breached. The general requirement that counselors keep information confidential does not apply when disclosure is required to protect clients or identified others from serious and foreseeable harm or when legal requirements demand that confidential information must be revealed. Counselors consult with other professionals when in doubt as to the validity of an exception. Additional considerations apply when addressing end-of-life issues. Counselors who provide services to terminally ill individuals who are considering hastening their own deaths have the option to maintain confidentiality, depending on applicable laws and the specific circumstances of the situation and after seeking consultation or supervision from appropriate professional and legal parties. When clients disclose that they have a disease commonly known to be both communicable and life threatening, counselors may be justified in disclosing information to identifiable third parties, if the parties are known to be at serious and foreseeable risk of contracting the disease. Prior to making a disclosure, counselors assess the intent of clients to inform the third parties about their disease or to engage in any behaviors that may be harmful to an identifiable third party. Counselors adhere to relevant state laws concerning disclosure about disease status. When ordered by a court to release confidential or privileged information without a client’s permission, counselors seek to obtain written, informed consent from the client or take steps to prohibit the disclosure or have it limited as narrowly as possible because of potential harm to the client or counseling relationship. To the extent possible, clients are informed before confidential information is disclosed and are involved in the disclosure decision-making process. 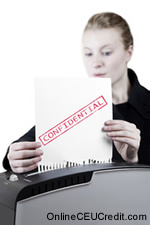 When circumstances require the disclosure of confidential information, only essential information is revealed. Counselors make every effort to ensure that privacy and confidentiality of clients are maintained by subordinates, including employees, supervisees, students, clerical assistants, and volunteers. When services provided to the client involve participation by an interdisciplinary or treatment team, the client will be informed of the team’s existence and composition, information being shared, and the purposes of sharing such information. Counselors discuss confidential information only in settings in which they can reasonably ensure client privacy. Counselors disclose information to third-party payers only when clients have authorized such disclosure. Counselors take precautions to ensure the confidentiality of all information transmitted through the use of any medium. Counselors protect the confidentiality of deceased clients, consistent with legal requirements and the documented preferences of the client. In group work, counselors clearly explain the importance and parameters of confidentiality for the specific group. In couples and family counseling, counselors clearly define who is considered "the client" and discuss expectations and limitations of confidentiality. Counselors seek agreement and document in writing such agreement among all involved parties regarding the confidentiality of information. In the absence of an agreement to the contrary, the couple or family is considered to be the client. When counseling minor clients or adult clients who lack the capacity to give voluntary, informed consent, counselors protect the confidentiality of information received—in any medium—in the counseling relationship as specified by federal and state laws, written policies, and applicable ethical standards. Counselors inform parents and legal guardians about the role of counselors and the confidential nature of the counseling relationship, consistent with current legal and custodial arrangements. Counselors are sensitive to the cultural diversity of families and respect the inherent rights and responsibilities of parents/guardians regarding the wel-fare of their children/charges according to law. Counselors work to establish, as appropriate, collaborative relationships with parents/guardians to best serve clients. clients consistent with their level of understanding and take appropriate measures to safeguard client confidentiality. Counselors create and maintain records and documentation necessary for rendering professional services. Counselors ensure that records and documentation kept in any medium are secure and that only authorized persons have access to them. Counselors obtain permission from clients prior to recording sessions through electronic or other means. Counselors obtain permission from clients prior to allowing any person to observe counseling sessions, review session transcripts, or view recordings of sessions with supervisors, faculty, peers, or others within the training environment. records, or portions of their records, only when there is compelling evidence that such access would cause harm to the client. Counselors document the request of clients and the rationale for withholding some or all of the records in the files of clients. In situations involving multiple clients, counselors provide individual clients with only those parts of records that relate directly to them and do not include confidential information related to any other client. When clients request access to their records, counselors provide assistance and consultation in interpreting counseling records. Unless exceptions to confidentiality exist, counselors obtain written permission from clients to disclose or transfer records to legitimate third parties. Steps are taken to ensure that receivers of counseling records are sensitive to their confidential nature. Counselors store records following termination of services to ensure reasonable future access, maintain records in accordance with federal and state laws and statutes suchas licensure laws and policies governing records, and dispose of client records and other sensitive materials in a manner that protects client confidentiality. Counselors apply careful discretion and deliberation before destroying records that may be needed by a court of law, such as notes on child abuse, suicide, sexual harassment, or violence. Counselors take reasonable precautions to protect client confidentiality in the event of the counselor’s termination of practice, incapacity, or death and appoint a records custodian when identified as appropriate. Information shared in a consulting relationship is discussed for professional purposes only. Written and oral reports present only data germane to the purposes of the consultation, and every effort is made to protect client identity and to avoid undue invasion of privacy. When consulting with colleagues, counselors do not disclose confidential information that reasonably could lead to the identification of a client or other person or organization with whom they have a confidential relationship unless they have obtained the prior consent of the person or organization or the disclosure cannot be avoided. They disclose information only to the extent necessary to achieve the purposes of the consultation. NCCs promote the welfare of clients, students, supervisees or the recipients of professional services provided. 34. NCCs shall protect the confidentiality and security of tests or assessments, reports, data and any transmission of information in any form. 45. NCCs who provide supervision services shall present accurate written information to supervisees regarding the NCC’s credentials as well as information regarding the process of supervision. This information shall include any conditions of supervision, supervision goals, case management procedures, confidentiality and its limitations, appraisal methods and timing of evaluations. 55. NCCs shall retain client records for a minimum of five years unless state or federal laws require additional time. After the required retention period, NCCs shall dispose of records in a manner that protects client confidentiality. 56. NCCs shall act in a professional manner by protecting against unauthorized access to confidential information. This includes data contained in electronic formats. NCCs shall inform any subordinates who have physical or electronic access to information of the importance of maintaining privacy and confidentiality. NCCs recognize the importance of and encourage active participation of clients, students or supervisees. 67.NCCs conducting counseling with more than one client at a time (e.g., group or family counseling) shall discuss with clients the nature, the rights and responsibilities as well as the possible additional limitations of confidentiality. NCCs shall also describe the steps that they will take in the event that having multiple clients in session creates issues between or concerning clients. 69. NCCs shall inform clients of the purposes, goals, procedures, limitations, potential risks and benefits of services and techniques either prior to or during the initial session. NCCs also shall provide information about client’s rights and responsibilities including billing arrangements, collection procedures in the event of nonpayment, confidentiality and its limitations, records and service termination policies as appropriate to the counseling setting. This professional information shall be provided to the client in verbal and written forms (i.e., the counseling services agreement). NCCs shall have a reasonable basis for believing that the information provided is understood. NCCs shall document any client concerns related to the information provided in the client’s record. 84. NCCs shall carefully consider ethical implications, including confidentiality and multiple relationships, prior to conducting research with students, supervisees or clients. NCCs shall not convey that participation is required or will otherwise negatively affect academic standing, supervision or counseling services. The c­hange in a social worker’s approach to ethical concerns is one of the most significant advances in our profession. Early in the 20th century, a social worker’s concern for ethics centered on the morality of the client, not the ethics of the profession or its practitioners. Over the next couple of decades, the emphasis on the client’s ethics began to weaken as social workers began developing new perspectives and methods that eventually would be fundamental to the profession, all in an effort to distinguish social work’s approach from other allied health professions. Most states have laws that either require or permit mental health professionals to disclose information about patients who may become violent – often referred to as the duty to warn and/or duty to protect. These laws stem from two decisions in Tarasoff v. The Regents of the University of California. Together, the Tarasoff decisions impose liability on all mental health professionals to protect victims from violent acts. Specifically, the first Tarasoff case imposed a duty to verbally warn an intended victim victim of foreseeable danger, and the second Tarasoff case implies a duty to protect the intended victim against possible danger (e.g., alert police, warn the victim, etc.). All states have laws that identify individuals who are obligated to report suspected child abuse, including social workers – these individuals are often referred to as "mandatory reporters." The requirements vary from state to state, but typically, a report must be made when the reporter (in his or her official capacity) suspects or has reason to believe that a child has been abused or neglected. Most states operate a toll-free hotline to receive reports of abuse and typically the reporter may choose to remain anonymous (there are limitations and exceptions that vary by state so please review your state’s laws). - Barker, R. L. (1998). Milestones in the Development of Social Work and Social Welfare. Washington, DC: NASW Press. The Goal of this Home Study Course is to create a learning experience that enhances your clinical skills. We encourage you to discuss the Personal Reflection Journaling Activities, found at the end of each Section, with your colleagues. Thus, you are provided with an opportunity for a Group Discussion experience. Case Study examples might include: family background, socio-economic status, education, occupation, social/emotional issues, legal/financial issues, death/dying/health, home management, parenting, etc. as you deem appropriate. A Case Study is to be approximately 150 words in length. However, since the content of these Personal Reflection Journaling Exercises is intended for your future reference, they may contain confidential information and are to be applied as a work in progress. You will not be required to provide us with these Journaling Activities. The preceding section contained Codes of Ethics for mental health professionals. Write three case study examples regarding how you might use the content of this section in your practice. According to APA, when is it appropriate to disclose confidential information without the consent of the individual? Record the letter of the correct answer the Ethics CEU Answer Booklet. Why Amazon Made Alexa HIPAA Compliant [email protected]Amazon's move into health care, with HIPAA compliance for virtual assistant Alexa, raises questions about what the tech giant plans to do with patient data. HIPAA Compliance in the Cloud: Who's Responsible? Infosecurity MagazineCloud compliance is important, although it does not have to be complicated.